The majority of our new-to-market instructions will now be uploaded on our website as Exclusive Listings. This allows you to see newly instructed properties advertised on the Chancellors website approximately 48 hours before we advertise the property on the major online portals such as Rightmove, Zoopla and PrimeLocation. As a registered buyer or tenant you will receive emails of these properties before applicants only looking on these portals get a chance to see them. This exclusive marketing gives our registered buyers and tenants an opportunity to enquire about and view properties before the average portal browsing applicant. This head start is good for all as it allows us to identify serious applicants for our clients who can be pre-qualified for the early viewings. By creating a My Chancellors account, you can add new properties to your Saved Properties list and find them again easily. You can book a viewing online 24/7, through the ‘Request Viewing’ button on the listing even if you are searching out of our office opening hours. Other benefits and features of My Chancellors are outlined here. 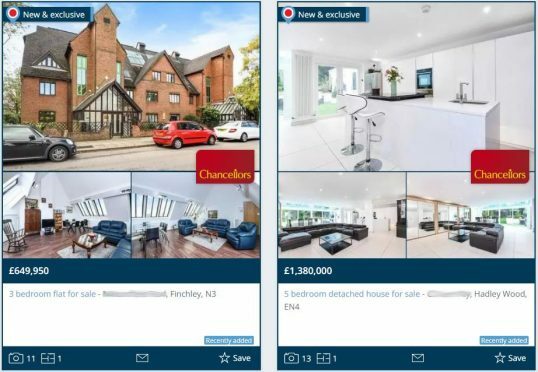 We have also implemented the ‘New & exclusive’ feature on these listings with OnTheMarket, meaning these properties appear at the top of the search results with a special, stand-out presentation for the exclusive period, and also appear at the top of property alert emails. This extra profiling of property again ensures we attract the serious applicant to view early. “We joined OnTheMarket in February with a 5-year partnership agreement to list all the sales and lettings properties of our 50+ offices across Southern England and Mid Wales. Our team conducts rigorous analysis as to the value delivered by our portal providers. We have been impressed by both the quality and the increasing quantity of leads coming to us from OnTheMarket as it has ramped up its spend, focused its advertising message on the thousands of new properties it gets before Rightmove or Zoopla and grown its base of agents and listings. Being on this and all other major portals ensures our clients get the maximum breadth of marketing to attract buyers and tenants. If you are looking to sell or let your property, please book a free, no obligation market appraisal and one of our local experts will be in contact to arrange a visit.